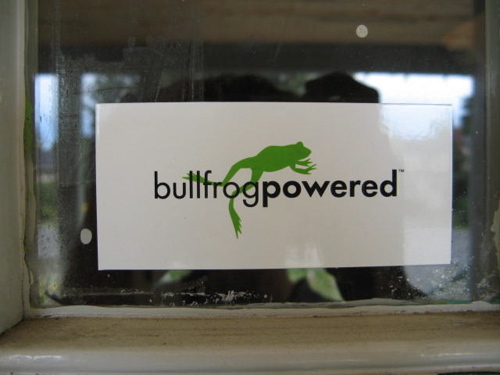 August marks our one-year anniversary of buying all of our household’s electricity from green-supplier, Bullfrog Power. According to their calculations (backed-up with thorough research) we saved 2.0 tonnes of CO2 over the past twelve months. If you’re keeping track, that means as a household of two bipeds we met our collective one tonne challenges at very little inconvenience to ourselves. In our case, we used just over 3,000 kWh of electricity last year at a cost (for just the electricity) of $273.00 through Bullfrog. That’s just $114.00 more than we would have paid to Hydro Ottawa for the same amount of juice. To look at it another way, through Bullfrog Power it cost us only $57.00 each to meet our one tonne challenges, making Bullfrog Power an easy and relatively inexpensive way for us to reduce our greenhouse gas emissions. For another Ottawan’s view on being a Bullfrog Power consumer see the blog, Trying To Be Green in Ottawa. Good article. Darren and I switched to Bullfrog last summer as well. And it is a small price to pay for the good it does. And it is heartening to see more and moore Bullfrog Power stickers popping up on the homes in our area.